There aren’t many major studio films that will take chances like RED SPARROW. But then again, most films don’t have the freedom that casting Jennifer Lawrence allows. Teaming again with director Francis Lawrence (THE HUNGER GAMES 2-4), this filmmaking duo are putting themselves out there as artists trying to find a (slight) deconstruction of eroticism within the spy genre. What we discover is a film with a mixed message that will only confuse its viewers with graphic violence and sexual fodder. Russian ballerina Dominika Egorova (Lawrence) is severely injured during a concert and is forced into retirement, which means no money, no housing and no medical care for her sick mother (Joely Richardson). Her shady uncle (Matthias Schoenaerts) is the director of an agency that’s looking for a mole who has been reporting Russian intel to the Americans. He feels like he can exploit Dominika’s beauty to plug the leak in his operations. This happens by sending her to a state school run by an emotionally detached Matron (Charlotte Rampling). There’s certainly no pleasure gained in her time at the school, rediscovering a new form of sexuality that’s void of emotion and horrifying to witness. Waiting in the wings is Nate Nash (Joel Edgerton), the American operative who just may be the puzzle piece to help Dominika gain the independence she’s always deserved. OK. There is a ton of plot in RED SPARROW, and if you’re not going to pay attention, or watch with the subtitles don’t even bother. Francis Lawrence and screenwriter Justin Haythe (A CURE FOR WELLNESS) aren’t interested in spelling anything out for the audience. The story isn’t filled with any gaping plot holes — just lots of intrigue that may come to bore many general movie-goers once the star-quality novelty has faded. Jennifer Lawrence brings her brand of bombastic movie star elegance to this role with a precision and poise that is articulated quite well just through her body language and stillness in her eyes. Accompanied with a thick Russian accent, she wisely doesn’t speak much in this film. Jennifer Lawrence and Joel Edgerton in RED SPARROW. Courtesy of 20th Century Fox. Be warned: Framed as a beacon of empowerment and body positivity, RED SPARROW revels in multiple scenes depicting sexual assault. Dominika gains her power through these encounters and it seems to be a misguided sense of power for a woman whose bravado can silence a room with just a stare. The film is not without its merits, it’s a beautiful piece of cinema that’s softly lit and casts out an entrancing mood. The Lawrences (director and star, though not related) allow the audience to find their own truths without manipulating. It’s a fascinating exercise in filmmaking that doesn’t always work. If there was more substance over style, maybe these hard-edged sequences would carry more weight, but, essentially, we are subjected to depravity for its own sake. 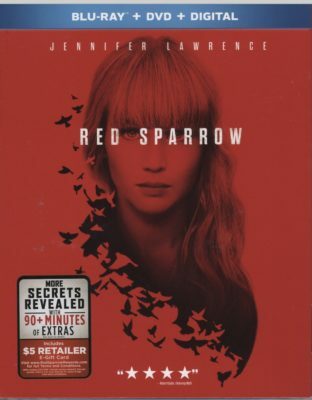 RED SPARROW challenges us as humans to hide the deepest parts of ourselves from the ones that hold power over us, whether it’s an authority figure or a lover. While it’s difficult to endorse the ideas presented here, as it tries a stab a new revamped form of feminism (but whiffs at nearly every turn), it’s a marvel to look at. Surprisingly, the RED SPARROW Blu-ray is a labor of love by 20th Century Fox and its director Francis Lawrence. It has over 90 minutes of special features, ranging from first looks into the ensemble cast, to an in-depth look at Jennifer Lawrence’s ballet training. RED SPARROW is available on Blu-ray, DVD and Digital HD today.